So DROID X 2.2 Update, What’s the Deal? One of the more frustrating topics that seems to be getting less play than we feel it should is the Android 2.2 update for the Droid X. You may recall that the DX’s press conference was one of the biggest events in recent history for a single device, claiming some pretty big things, most importantly that Froyo and Flash 10.1 would be just a few short weeks away from launch or by “the end of summer.” Well guess what? We’re almost in early fall and have zero idea as to when this thing might actually drop. No word from Verizon and no word from Motorola has left many of us completely frustrated especially with the growing list of known issues for the device on 2.1. We’ve seen 2 separate leaks come out, one of which was C&D’d out of existence by Motorola since they refused to provide support for it, and another which most didn’t bother touching after a variety of issues appeared. Personally, I’ve been running the original leak from day 1 and can say that this phone has never run any better. This thing is as close to a final build as you’ll see sans a couple of minor bugs. We’re now a month out from that dropping and still nothing. What might be even more frustrating than seeing leaks removed though, is the fact that the Droid 2 launched, preloaded with Froyo and Flash. And after seeing it’s system dump playing perfectly well with the leaked 2.2 for the DX, it’s pretty mind boggling as to why we’re still waiting. The hardware on both phones is identical aside from a screen and keyboard, and after using my D2 for a few weeks, I can see that the software is about as close for 2 phones as you’ll find. Now aside from all of that, we’ve received probably a dozen emails from DX owners over the last 2-3 weeks who have spoken directly with Verizon support and have all been told that the DX update is currently rolling out in batches. Really? For some reason though, we have zero confirmations. And actually, the newest tip we received was pretty specific. The rep mentioned numbers claiming that there 520,000 Droid X’s in the wild and the update is hitting 10,000 of them at a time. By our calculations, that’s 90,000 since we first reported this support rumor, but we sit in silence on the confirmation front. 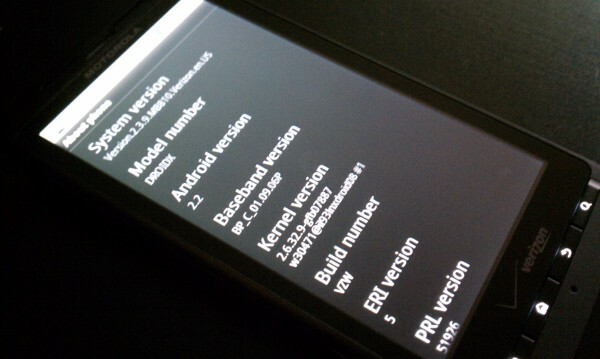 And lastly, we broke news on this secret Verizon Droid X 2.2 screen on Monday which has been created to send via text message to DX owners once the 2.2 rollout has completed. So the page is there (droiddoes.com/2.2x), still live, just waiting and teasing all of us. Should we continue to think the update is just days away? Or are we back to thinking it’s months away? Or is it actually rolling out now? What? Without standing on a soap box demanding an answer, don’t we have reason enough to at least ask Big Red and Moto what’s up? Don’t we at least deserve some sort of update on progress? Most people bought this device with the understanding that it would be at the forefront of the Android game, but it’s really just been falling behind. Thoughts? Feel free to vent after a couple of Friday happy hour pints, just keep it clean.